Edgar Yipsel Harburg, known as E.Y. 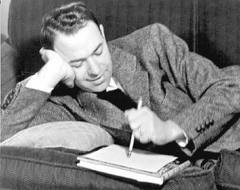 Harburg or Yip Harburg, was an American popular song lyricist who worked with many well-known composers. He wrote the lyrics to the standards, "Brother, Can You Spare a Dime? ", "April in Paris", and "It's Only a Paper Moon", as well as all of the songs in The Wizard of Oz, including "Over the Rainbow."